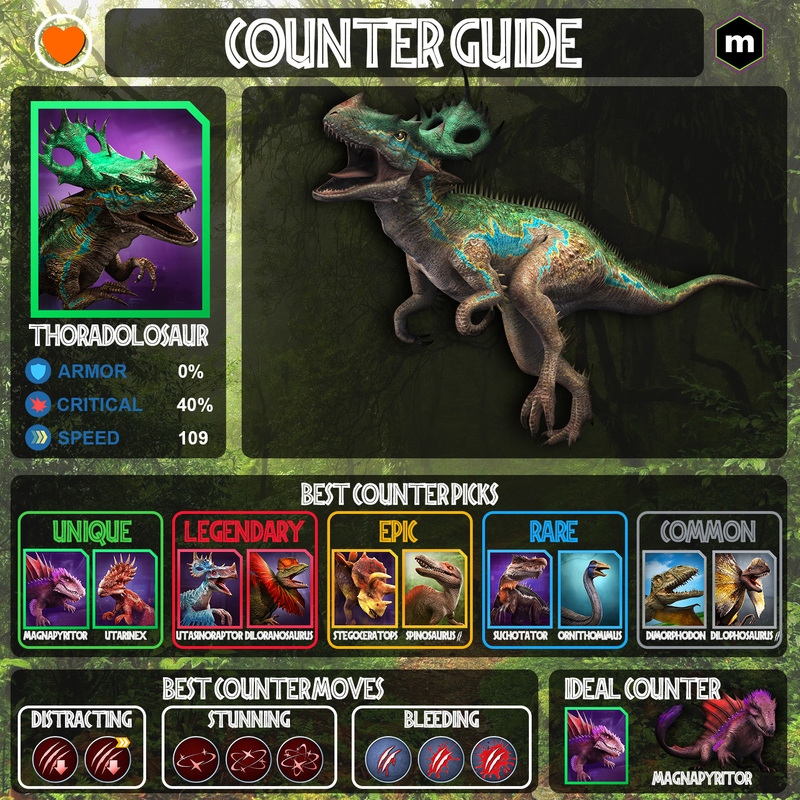 Thoradolosaur, often called “Thor” for short, is a very fearsome chomper, one of the best at the moment, and is very commonplace in the arena, and gives many players troubles to deal with it. If you’re one of those, don’t worry, explorers, because this guide will detail on how to deal with Thor! In order to understand how to counter Thor, we look at its stats first, then its strengths and weaknesses. Instant Charge Deal 1x damage. Priority. 75% chance to stun for 1 turn. Thor has a typical moveset of a Tyrannosaurid chomper, with defense shattering strike, impact and rampage, along with a “speed control” priority move in Instant Charge. What makes Thor more threatening than other chompers, however, is that 40% crit chance, which is much higher than average (the only other creatures with 40% crit chance are Tarbosaurus and Ophiacodon). This means it gets a critical hit roughly once every other turn. Almost everyone has been on the receiving end of a Thor on a rampaging crit spree, and it is not fun to say the least. It also has fairly decent health for a chomper, which means in most cases it can take 2 hits at least, while dealing out 2 hits of high damage back. So, how do you counter this? One can see that at 109 speed, while fairly fast for a chomper, Thor isn’t breaking any speed records. Neither is Thor immune, which means it can be prone to distractions, stuns and bleeds (and it cannot cleanse bleeds/distractions). Those are the exact weaknesses of Thor one can exploit in order to counter it. Distract its damage, and you gain the upper hand and are at less risk of getting punished hard by Thor. Similarly, disable Thor from making a move by stunning it. If you have neither option, you can bleed Thor so it is guaranteed to faint in 3 turns if the player doesn’t swap it out. Immunity helps a lot more than usual, because it prevents you from missing a turn due to Thor’s Instant charge. Now that Thor’s weaknesses have been identified, the best counters can be determined. Magnapyritor is the most reliable counter to Thor, due to its immunity, distracting impact and Defense shattering rampage/null impact. It has sufficient health to survive a critical distracted impact hit from Thor, and a critical distracted Instant charge from Thor to take it out in 2 turns, with a 3 level disadvantage! Diloracheirus and Utarinex are two other similar counters, albeit lacking immunity, but their distracting, stunning and hit-and-run moves prove too much for Thor to cause trouble. If you do not have uniques, the next best counters are Utasinoraptor, Diloranosaurus and Spinotasuchus. Utasino and Dilorano have a combination of distracting and stunning moves, and high damage output over 3 turns to take down Thor. Spinotasuchus usually trades kills with Thor, but the Lethal wound damage means Thor is most certainly taken down by turn 3. Going down to the epic rarity tier, your best counters are Stegoceratops and Spinosaurus G2. The former can use a combination of slowing impact and stunning moves to prevent Thor from making a move, and the latter can lethally wound it and trade kills. Procerathomimus is another possible counter, albeit glassy, but it can use a combination of instant distraction and distracting rampage to reduce damage taken from Thor. It might have to rely on some dodging, however. Some lower rarity counters include Suchotator with its lethal wound and Instant distract combo which means it can survive 2 turns of Thor’s damage in most cases. Ornithomimus might not be the most reliable counter, but a combination of evasive strike and instant distract, followed up with impact and run, means it can take down Thor with a bit of luck. If you lack these counters, your next best chance is to rely on some dodging luck and get your best distracting/stunning/bleeding dinos as possible and reduce Thor’s health and damage. Special thanks to our in-house artist Orange Heart for preparing a wonderful infographic on how to counter Thor! While Thor might seem formidable to most, there are certainly no shortage of options to counter it. Hope this counter guide helps you with the same, and good luck in the arena! If you have any questions or wish to join in on the discussion, let us know in the comments or join Metahub’s discord server!